For the ethnic group from Myanmar, see Kayan people (Burma). "The Tattooing of a Married Kayan Woman," (c. 1896-98), photograph by William Henry Furness III. Illustration from The Home-Life of Borneo Head-Hunters (1902). The Kayan is an indigenous tribe from the island of Borneo. The Kayan people are categorised as a part of the Dayak people of Borneo. Being an indigenous tribe in Borneo, the Kayan people are similar to their neighbours, the Kenyah tribe, with which they are grouped together with the Bahau people under the Apo Kayan people group. The population of the Kayan ethnic group may be around 27,000. They are part of a larger grouping of people referred collectively as the Orang Ulu, or upriver people. Like some other Dayak people, they are known for being fierce warriors, former headhunters, adept in Upland rice cultivation, and having extensive tattoos and stretched earlobes amongst both sexes. 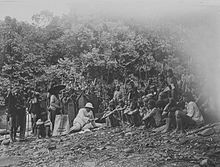 A European man discussing with the leaders of the Kayan people in Sarawak, circa 1900 to 1940. They may have originated from along the Kayan river in the North Kalimantan province of Borneo. They live along the upper Kayan and the middle Kapuas and Mahakam rivers. They seem to have expanded to the south in Sarawak in historic times, generating some conflicts with the Iban that were expanding north at the same time. They have settled in Sarawak on the middle Baram River, the Bintulu River and along the Rajang River, having been pressed back a little during the late 19th century. In 1863 West Kalimantan, Iban people migrated to the upstreams of Saribas River and Rejang River and started to attack the Kayan people in those areas and continued doing so northwards and later eastwards. Wars and headhunting attacks have caused many other tribes to be displaced, including the Kayan people, who make up of 1.4% of the West Kutai Regency population. Significant expansion to the east Borneo also occurred during the historical times, the conversion of the Kayan people to Islam forming the ethnogenesis of the Bulungan people. The Kayan language belongs to the Malayo-Polynesian branch of the Austronesian language family. Their basic culture is similar to the other Dayak people in Borneo. Their agriculture was based upon shifting cultivation techniques and the cultivation of Upland rice. Other farming such as sago, corn, yams, pumpkin and tobacco are also cultivated. During the years of famine, sago is mined. Fishing (killing fish with poisons) plays an important role, and a smaller role is played by hunting with a sumpitan. The Kayan people are engaged in breeding pigs and chickens, while dogs are kept for ritual purposes. The Kayan people are known as excellent blacksmiths (the Kayan Mandau swords are the main item of exchange), boat builders and carpenters. Loom, weaving, production of tans, arts, wood carving, making of masks and pottery are also developed. Traditionally, they live in long houses on river banks. Their settlement consists of one or several long houses as long as 300 meters, which can accommodate up to 100 families (400–600 people) and consist of a common veranda and rooms. Residents of a long house constitute a tribal community. The Kayan people are divided into three endogamous caste-estate groups; "house owning group" or aristocrat (ipun uma or keta'u), community members or commoners (panyun) and slaves (lupau). Among the nobility, marriages are usually outside of the community, often with other tribes; while community members and slaves usually marry within the community. The leader is usually elected from the nobility class (in the 19th century, he also served as a military leader). The settlement is bi-localized, and the filiation is bilateral, while the system of kinship is of the English model. The Kayan people a developed mythology and a complex cult (bounty hunting and human sacrifices that disappeared at the beginning of the 20th century, as well as shamanism). The core event was the feast of collected heads (mamat), during which warrior initiations and funeral ceremonies were held. In the 20th century, the Kayan people began to convert to Christianity. ^ Kayan in the Encyclopædia Britannica Archived 14 June 2006 at the Wayback Machine, retrieved on 12 August 2006, from Encyclopædia Britannica Premium Service. ^ Monthly Packet, Volume 12. J. and C. Mozley. 1857. p. 370. ^ a b c d Richard Ibuh (2014). The Kayans. Partridge Publishing Singapore. p. 8. ISBN 14-828-2683-6. ^ Michaela Haug (2010). Poverty and Decentralisation in East Kalimantan. Centaurus Verlag & Media KG. ISBN 9783825507701. ^ Anthony Milner (2011). The Malays. John Wiley & Sons. ISBN 14-443-9166-6. ^ Jérôme Rousseau (1990). Central Borneo: Ethnic Identity and Social Life in a Stratified Society. Clarendon Press. p. 134. ISBN 01-982-7716-4. ^ Kathy MacKinnon & Gusti Hatta (2013). Ecology of Kalimantan: Indonesian Borneo. Tuttle Publishing. ISBN 14-629-0505-6. ^ a b Frank M. LeBar & George N. Appell (1972). Ethnic Groups of Insular Southeast Asia: Indonesia, Andaman Islands, and Madagascar. Human Relations Area Files Press. p. 170. ISBN 08-753-6403-9. ^ "Great Britain. Colonial Office". Colonial Research Studies, Issue 1. H.M. Stationaery Office. 1950. p. 72. ^ David Levinson, ed. (1993). Encyclopedia of World Cultures, Volume 5. G.K. Hall. p. 134. ISBN 08-168-8840-X. ^ David Levinson, ed. (1993). "Encyclopedia of World Cultures, Volume V: East And Southeast Asia" (PDF). G.K. Hall & Company. p. 134. ISBN 0-8168-8840-X. Retrieved 2018-09-22. ^ Souchou Yao (2013). Confucian Capitalism: Discourse, Practice and the Myth of Chinese Enterprise. Routledge. p. 153. ISBN 11-361-2794-1. ^ Monthly Packet, Volume 12. J. and C. Mozley. 1857. p. 371. ^ Robert P. Gwinn (1987). The New Encyclopaedia Britannica: Micropaedia, Holderness - Krasnoje, Volume 6. Encyclopaedia Britannica. p. 773. ISBN 08-522-9434-4. ^ Frank M. LeBar & George N. Appell (1972). Ethnic Groups of Insular Southeast Asia: Indonesia, Andaman Islands, and Madagascar. Human Relations Area Files Press. pp. 171–173. ISBN 08-753-6403-9. ^ Peter Metcalf (2009). The Life of the Longhouse: An Archaeology of Ethnicity. Cambridge University Press. p. 190. ISBN 11-394-8170-3. ^ "Alam Lening, lagu Dayak Kayaan Mendalam". YouTube. Retrieved 26 September 2014. ^ "Lung Kayaan". YouTube. Retrieved 26 September 2014. The Pagan Tribes of Borneo by Charles Hose and William McDougall from 1912. 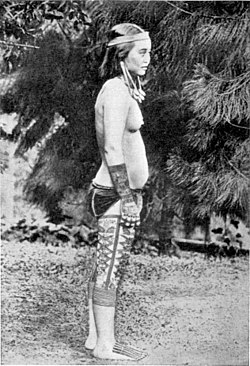 Wikimedia Commons has media related to Kayan (Borneo).